You are here: Home / Featured Stories / Rare Disease Day 2012 – Spread This Call To Action To Make A Difference! Call To Action: Join the RARE team on Facebook! 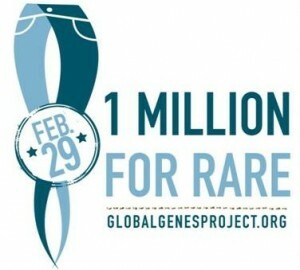 World Rare Disease Day 2012 is coming up on February 29th. Consider these staggering statistics. Only 21 FDA approved new drugs per year after all this money and research effort?! Does anyone else think that something is seriously wrong? Thanks to the Myelin Repair Foundation and Scott Johnson for creating this amazing video outlining these shocking statistics. 1 in 10 Americans are affected by some type of a rare disease. That’s a huge number of people – 30 million according to the NIH. The amount of drug approvals for the entire rare disease community each year is extremely low – potentially only 5 or so drugs a year out of the 21 total drugs the FDA approves. To date, only 5% of rare diseases have a treatment! For 95% of rare diseases, there is not a single approved treatment. There are 7,000 different types of rare diseases – from Amyotrophic Lateral Sclerosis (Lou Gehrig disease) to Ewing’s Sarcoma to Friedreich’s Ataxia to Cystic Fibrosis to Hemophilia to Krabbe disease to Langerhans Cell Histiocytosis. My twins have a fatal rare disease called Niemann Pick Type C and are currently fighting for their lives. Please help people with rare diseases today by taking action to raise awareness for all people who have no treatments, let alone cures. – Join the “1 Million for Rare Disease ” awareness movement by displaying the 1 Million Logo on to your website or Facebook page. Write about how a rare disease you or a loved one suffers from impacts your family. – “Like” the Global Genes Project on Facebook: http://www.facebook.com/globalgenesproject. – Get a Denim Ribbon Kit from the Global Genes Project and make blue ribbons to spread awareness. Contact amyg@rareproject.org to order ribbons or kits. – Tell friends and family about this awareness campaign by forwarding this blog, re-posting on Facebook, etc. Just as the breast cancer community has come together, we need supporters to join together to demand action and change. Please consider spreading my “call to actions” and join the effort to raise awareness during the month of February. Write a blog like mine that lists other rare diseases to help spread awareness. Keep up the good fight! You are very brave in what you are doing and you are an inspiration to many mothers I am confident of that. I have a cousin brother who was born with something very strange where water was filling his head just after his birth, the Doctors managed to saved his life but he was left with a terrible disability. Later due to a doctor prescribing him the wrong medication he was left blinded in both eyes. Please keep up with what you do. Our prayers are with you and your family. What an inspiring blog! Your girls are beautiful, and my prayers are with you. I ditto what Mindy said, and I hope that today’s blog hop will bring more attention to Niemann Pick Type C.
I’ve followed your story for awhile now and am a big fan of your advocacy and fighting spirit for your girls. Hope that today’s blog hop brings much attention to Niemann Pick Type C !